Summer Of Glitter, Glam and Love!! And so, the North American leg of Adam Lambert’s Glam Nation Tour comes to an end. I was lucky to attend one last show in Saint Petersburg, Florida on September 18th. My husband and I flew down for the weekend (! 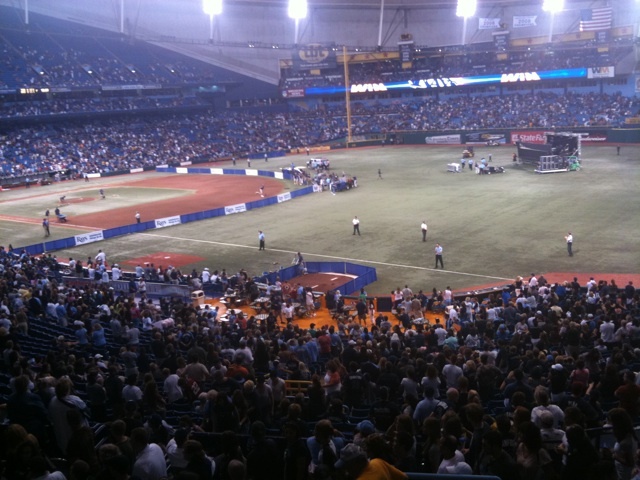 ), and had the pleasure of seeing Adam perform at Tropicana Field. It was my husband’s first chance to see Adam perform live. At the end of the show he declared Adam to be the best vocalist he ever heard!!! The concert started after a Tampa Bay Rays baseball game (which went into overtime!). I had scoped out the venue during the game so I could find out where to line up for the concert. The venue sold wristbands to anyone who wanted to watch the concert from the field itself (others could watch from the stands). For everyone with wristbands, it was general admission, and being first in line meant closest to the stage. We were told we could line up during the 7th inning of the game. I made sure I was there at the end of the 6th inning, to ensure a good spot. Once the seventh inning started, it was pretty much bedlam in the lineup area downstairs!!! There was lots of pushing and shoving- very intense. 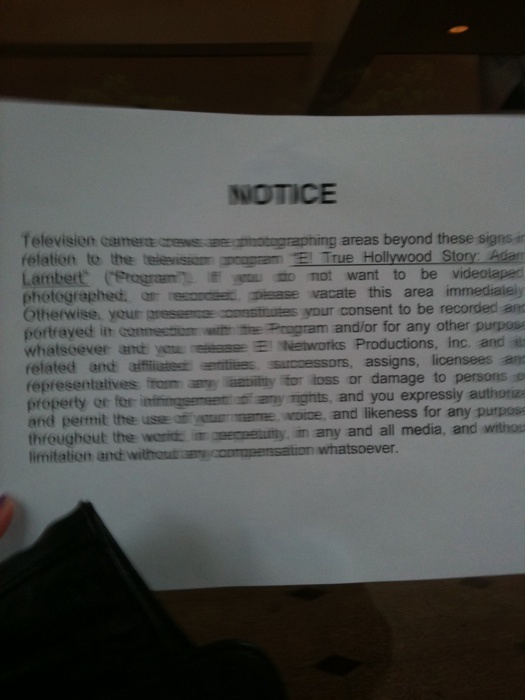 Fortunately I, got pushed to pretty much the head of the line! There I met some awesome other fans (hi Nik! ), and we settled in to wait for our entry on to the field. My husband joined me in line a bit later (the other fans around me were gracious enough to let him in). Allison Iraheta performed first, and then Adam hit the stage!! The show was spectacular as always. Not sure how Adam does it night after night. His voice was strong and pure, and the crowd of about 30,000 (including those who remained in their seats in the stands) went wild!! I was able to capture two videos: Sure Fire Winners and the encore, 20th Century Boy. Enjoy!! Wow, what a show. I gotta tell ya, this last concert was just as good (if not better) than the first I experienced, where Adam absolutely blew me away!! A big thanks to him, the band, and his crew for entertaining us so incredibly all summer!!! I was fortunate to have yet ANOTHER encounter with Adam by the buses after the show that night. He looked adorable, with sunglasses, a light blue shirt and jeans. I grabbed his hand to tell him I was sorry about what he was going through (paparazzi, etc). He grabbed my hand back, and said he was so over it, that the police weren’t pressing charges, and it was all good!! So that’s it, GlamFans. I’m truly glad I was able share my summer of glitter, glam and love with you!! Adam’s off to foreign lands, where he’ll continue to keep us entertained…yes, it’s all good!! Top picture credited to http://twitpic.com/photos/Grrrr_girl . Click on the link for more!! Adam at the buses picture credited to http://twitpic.com/photos/fiarra. Click on the link for even more great photos! Heehee- I’m sure my friend Sue has Adam saying her name in the interview as a ringtone on her phone (or something like that- hmm, Sue??). Check out the rest of the ProFm site with pictures and videos from the show that night at Lupos: http://92profm.com/PhotoWall.asp?id=64246. 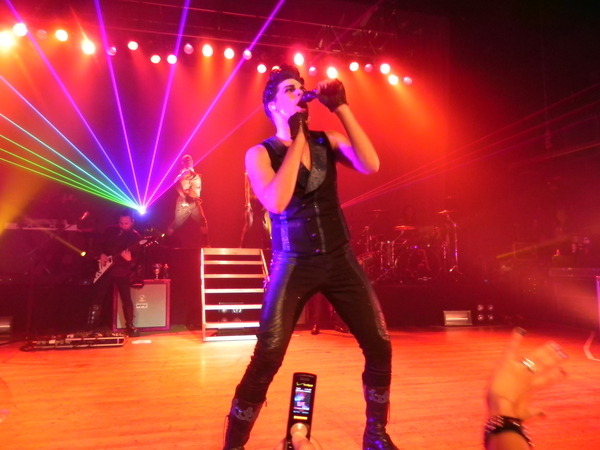 Adam performed in Albany on August 23rd. Find videos of that show from TALC Vids at http://www.youtube.com/user/TALCvids. Can you just feel the energy???? Upon entering the venue, we were ushered back stage behind the buses where we were greeted by Neil (truly a sweetheart!). 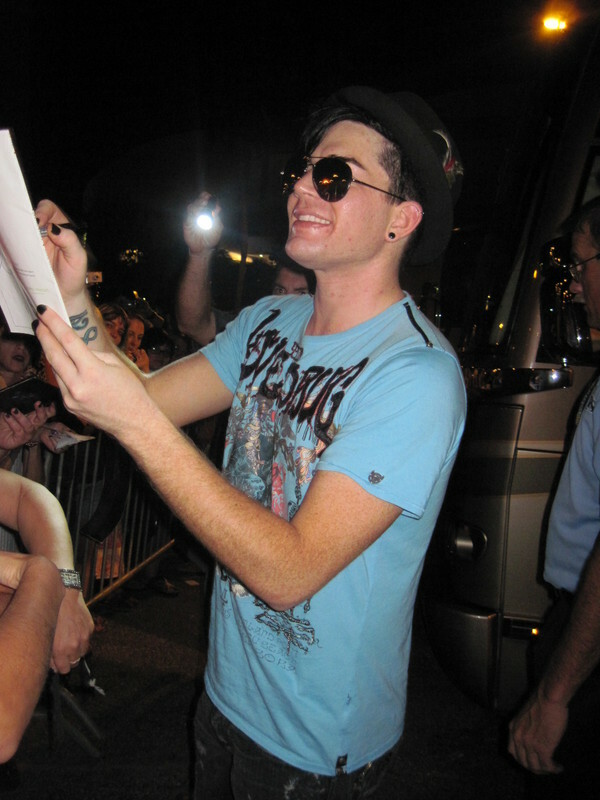 Adam came out moments later and looked HOT in a feathered hat, dark jeans and a gray t-shirt. 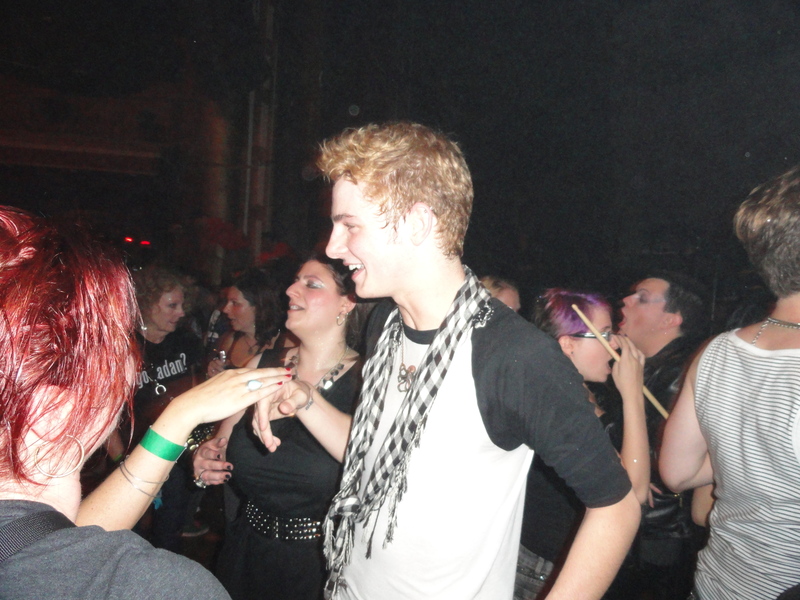 I kind of hung back and watched him greet the other fans, knowing that as soon as we met him we had to leave. I wanted to stay there as long as possible! He was so nice to everyone, patient as they shared a picture, a story or just wanted a hug. Soon it was my turn! I walked up and introduced myself, telling him we met the other day at the pool party. He said that he remembered me(!!). We talked about his “tongue diving” incident in Providence: he said that once he does something like that, people tend to expect it, but that he wouldn’t be doing that regularly! I told him I got it on film, and I had posted it on my blog, and he said he thought he saw it here (hi, Adam!)!!!!! I told him I was there because of Donorschoose.org (my friend Sue and I raised almost $2000 at our Glamfest before the Foxwoods show in June), and what a great charity it was. He seemed pleased to hear that. I slipped him a note I had written, we had our picture taken, I asked for a hug (mmmmmm), and that was it!! He smelled and felt yummy. It was a moment I’ll treasure always. I was amazingly calm (I hear he has that effect on a lot of his fans who meet him). He seemed like a really nice, regular guy. Amazing, considering what he can do to us once he’s on stage!! I feel really content now, almost serene. Everything going on around me: work, kids, the general chaos of life, really doesn’t phase me at this point. I thank Adam for that. 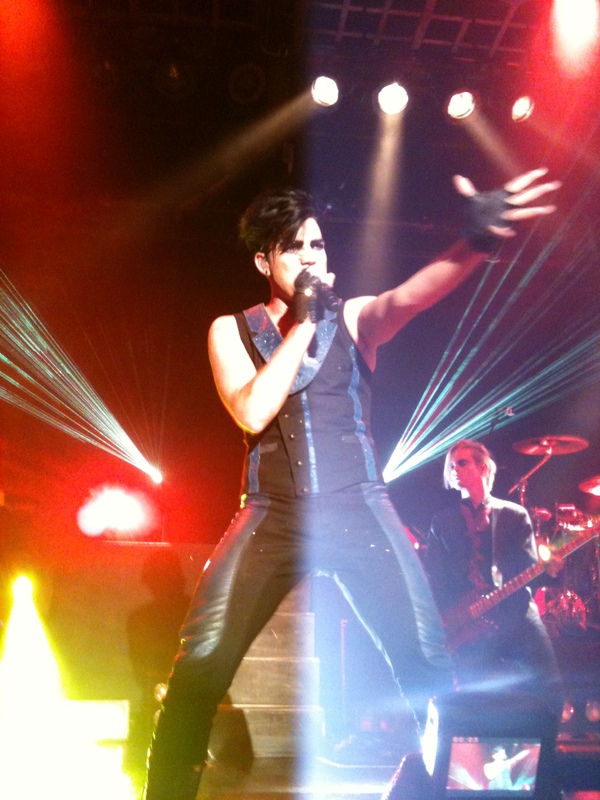 Life is really good….#becauseofAdamLambert!!! Just got back from an AMAZING week following Adam Lambert and his Glam Nation tour around New England! I met Adam for a SECOND time at a meet and greet in Hyannis before the show at the Cape Cod Melody Tent there. I was able to speak to him for a bit longer this time. He was gracious, kind and patient with me as I gushed and flailed!! More about that in my next post! But first I want to share some great videos I was able to get at the Casino in Hampton Beach, New Hampshire on August 21st. The venue was down and dirty (just the way we like ’em for general admission shows), and I had a spot dead center stage in the second row!! Enjoy! And finally, a SPECTACULAR 20th Century Boy!! You can find a lot of my tweeted pictures from all three shows at http://tweetphoto.com/user/4999737 . I MET ADAM LAMBERT…And A WILD Night At Lupos!!! Several friends won tickets to a meet and greet (sponsored by radio station 92 ProFM in Providence) at Aqua, a poolside restaurant in Providence, Rhode Island. 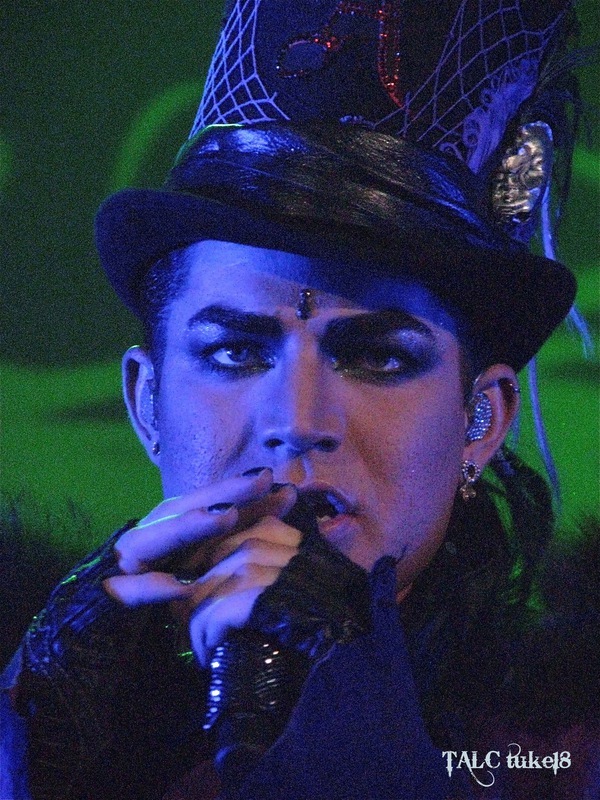 Adam was scheduled to perform later that evening at a club called Lupos. I had reservations to stay at the hotel where the pool party meet and greet was being held, so I offered to drive my friends over to the event. I figured I would settle into my room and perhaps get a glimpse of Mr. Lambert as a bonus!! I dropped my friends off, and kind of hung around, hoping to see Adam as he entered the pool area (yes I know, kind of stalkerish!!). As it turns out I got VERY lucky when a kind, compassionate radio station employee graciously saw me sitting there (I had asked if there were any extra tickets to the event earlier and was told no) and allowed me to enter the event…I was going to meet ADAM LAMBERT!!! My friends (already settled and waiting for Adam to arrive) squealed as I entered the pool area; I promptly burst into tears! I couldn’t believe this was happening!! We all waited excitedly for the man of the hour, and when he finally arrived to our delight he took a seat about ten feet away from us!!! He looked absolutely gorgeous- much younger than I expected. He was quite casual with a bit of makeup (including his signature black eyeliner- THUD!). Find the rest of the ProFM pictures here: http://www.92profm.com/PhotoWall.asp?id=64246. The experience was the thrill of a lifetime. 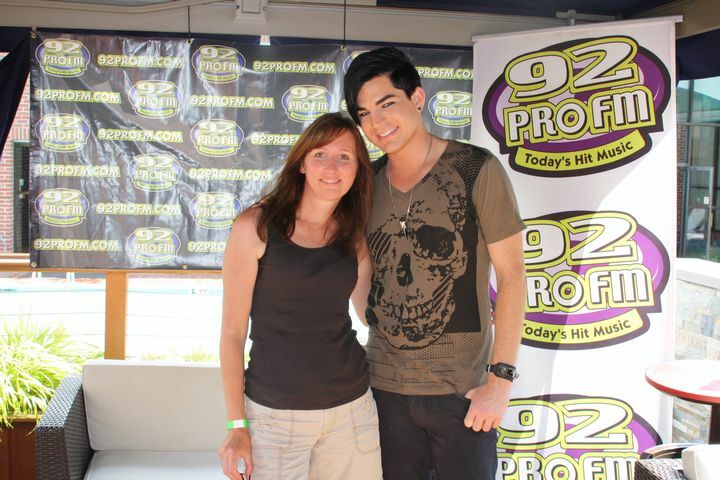 I won’t ever forget the kindness of the radio station, and Adam- sooo sweet!!!! Later that evening, Mr. Lambert put on the show of a lifetime…the man was ON FIRE!! There were lots of boys in the front row, and I had a feeling it was going to be epic! I’m going to share one video with you, GlamFans (brace yourselves!). Some of you have probably seen other versions of this song, but I had a unique perspective from my viewpoint in the theater. I give you: 20th Century Boy!!!! After the concert I spoke to both fans Adam kissed and got their pictures. The boy’s name was Eric, and the girl’s name was Erica!!! See their pics below (heehee!)! 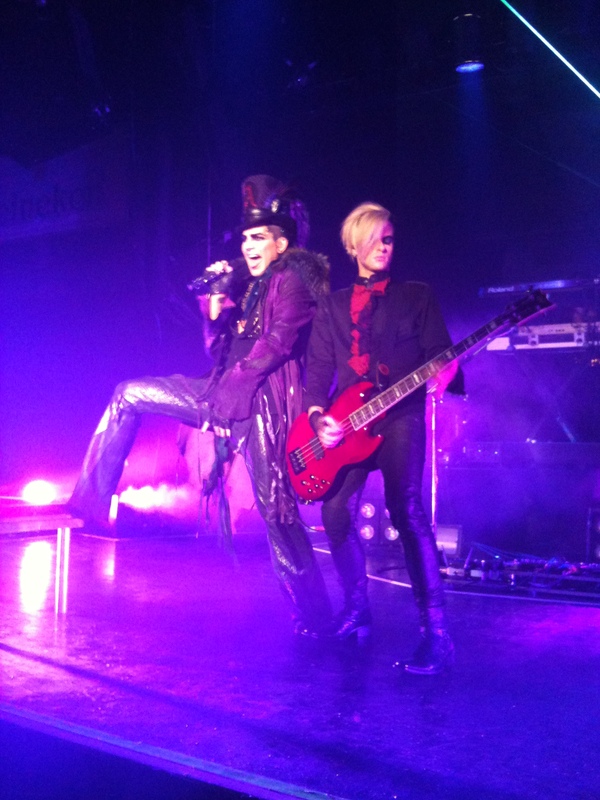 Check out some of my pictures from the show at http://tweetphoto.com/user/4999737 And please GlamFans, follow me on Twitter at http://twitter.com/GlamFanNation Lots more pics, news, info etc about Adam tweeted throughout the day!! Next stop: Hyannis- can’t wait!!! Adam Lambert: It’s Showbiz, Honey!! And if you didn’t see the live stream of Adam’s interview with Q102, you can find parts 1-3 here: http://www.youtube.com/user/xGlitterNGlamx#p/u Also, pictures from the interview can be found at http://www.q102.com/cc-common/gallery/display.html?album_id=246221. Blog This Mom writes so wonderfully about her meeting Adam (for the 3rd time!!). 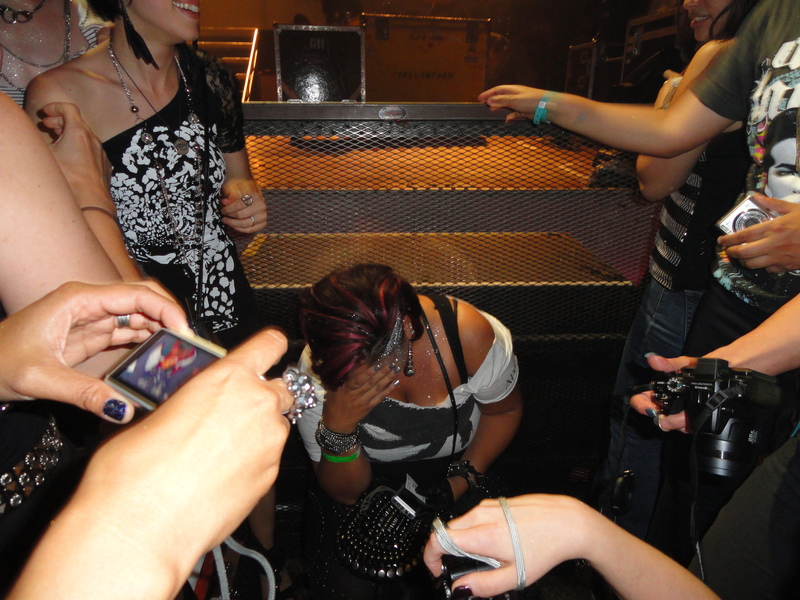 Find the link here: http://blogthismom.blogspot.com/2010/08/adam-lambert-in-san-diego-my-backstage.html– hysterical!! 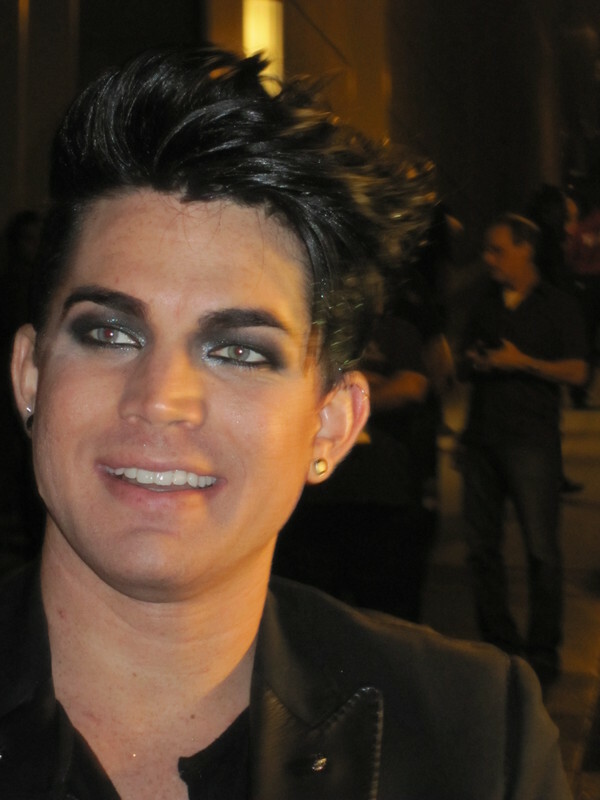 Also, check out this interview from Fest Blog’s Lehigh Valley Music: http://blogs.mcall.com/lehighvalleymusic/2010/08/asking-adam-lambert-american-idol-runnerup-talks-about-his-music-his-controversies-and-his-future.html. Well, that’s it for now. Please follow me on Twitter at http://twitter.com/GlamFanNation as I tweet up to the minute info about Adam throughout the day (yeah I know, I’m obsessed!!)! Please also consider donating to our donorschoose.org giving page at http://www.donorschoose.org/donors/viewChallenge.html?id=29209&utm_source=dc&utm_campaign=twitter&utm_medium=givingpage your donations go to a very good cause, and would make Adam (and me!) very proud! If you can’t get enough of Adam’s Glam Nation tour videos, go to http://www.youtube.com/user/suz526 for more of the latest!!! And finally, a “shy” pic of Adam hanging out with his friends on his day off!! And I leave you with this bit of glittery fun, GlamFans!